Hardwood deck, work in progress. A deck like this will transform your outdoor area. 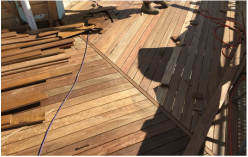 30% OFF 40 sq.m or more, valid for bulk timber order of spotted gum Australian hard wood decking. Orders up to 30 June 2015. I like what Mr Fitzgerald has said here and with that said, welcome to all those who visit our new site. Have a browse and don't hesitate to contact me to have a chat about your next project.